This book dispels the myth that Visual Basic is just too slow to write a decent game, giving readers all of the tricks and techniques that they need to create awesome games using Visual Basic. Offering equal parts theory and hands-on exercises, the chapters in this book begin with a discussion of completing a task using Visual Basic, and then move on to enhancing the code. The final section of the book is devoted to developing complete games, including a 3D arcade game, a multiplayer space combat game, and more. 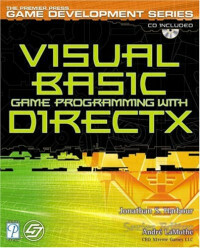 Ideal for readers who are new to game programming or simply new to Visual Basic, this book offers everything readers need to create amazing games by combining the hidden power of Visual Basic with DirectX.